The more years that go by, the more convinced I become that sun protection is of the utmost importance. I suppose I'm lucky that I'm extremely pale and can't go in the sun without applying SPF 50 (and, even then, I still burn to a crisp within 30 minutes). But I am constantly encouraging others to wear sunscreen, stop lying in tanning beds, you name it. Luckily, Neutrogena and board certified dermatologist Dr. Doris Day are here to help clear up some myths and provide facts about sun protection. Myth #1: 50 minutes a day of sunlight is necessary for vitamin D.
"Incidental sun exposure is plenty for most people," says Dr. Day. "There are supplements available to fulfill any deficiencies if you have them. Thus, vitamin D is not an excuse to get a tan and certainly not an excuse to go to a tanning bed." Myth #2: You need a base tan before you go on a vacation. "Does anybody still believe this? There’s no such thing as a base tan -- it’s just one more excuse to have a tan," says Dr. Day. "If you don’t want to get sunburned on vacation, use your sun protection and be sun smart." Myth #3: You have most of your sun by the age of 18, and it doesn’t matter what you do after. "No matter your age or how much exposure you’ve had, every exposure you get at any age is cumulative and damaging to the skin," says Dr. Day. "Your skin has the ability to repair no matter how old you are. If you start today just by using sunscreen alone, all of those other expensive products that we are spending so much money on will work so much better. It is never too late to start protecting your skin." If you don’t need a flashlight, you need sunscreen. Dr. Day says that she sees some of the worst sunburns on cloudy days. Not all broad-spectrum sunscreens are created equal. Neutrogena products are formulated with Helioplex technology, which contains high UVB and high UVA protection across the board. SPF matters. Surveys reveal that more than 70 percent of Americans do not reapply sunscreen when they are outdoors for long periods of time. Because so many people under-apply sunscreen, it's important to look for high value SPFs. Dermatologists like Dr. Day recommend SPF 30 and above, but don’t be afraid to go higher. Live by the shot method. You need one ounce of sunscreen every two hours. As a visual, that's enough to fill a shot glass. Protecting your family and yourself can also protect others. 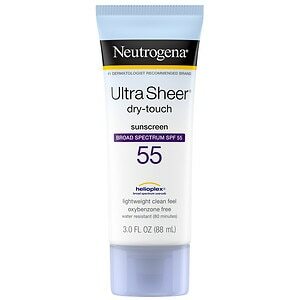 Through July, Neutrogena will donate one sunscreen for each purchased. Learn more here.